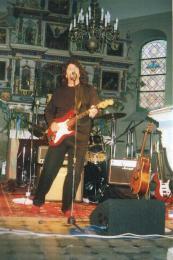 It is 3 years since Phil Bates last performed here in Germany. Luckily Phil came to visit his fans here in this special town of Brandenburg. He has decided to begin his short German tour at the industrial museum here in the city Brandenburg on 20th September 2003. The former steelmaking factory now stands as a mo nument where nowadays it is used frequently for live concerts. It was also a nice surprise to meet fellow FTM readers from Eberswalde and Roederau, which made me happy. Prior to the Phil Bates Band, the support act came onto the small stage, and as the 4 musicians played, the venue slowly began to fill with about 200 people as they took their places at the tables scattered around. At ten to nine, slowly the musicians came onto the stage. The keyboard player started to play the intro which was unknown to me. Then the drummer and bassist took their positions. Finally came Phil Bates, completely in black clothes who started off the gig with "Evil Woman". What a great experience this is for me to hear live E.L.O. music once again. At the end of the song, the audience applauded loudly in appreciation. The songs naturally sounded a lot different to when they were brilliantly performed at the great ELO Part 2 concerts and of course the original E.L.O. With the slower songs, Phil changed for the acoustic guitar, slightly different to the one he used during the ELO Part 2 concerts. The backing band were all musicians from the Berlin area. 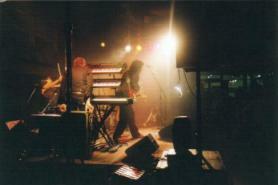 The keyboard player had a heavy smoking habit and was smoking throughout the concert. Ash fell over the keyboards but did not seem to cause any problems. 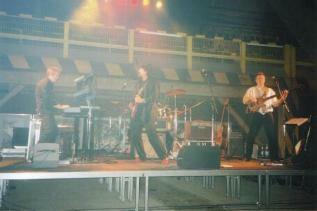 The bassist, called Ralf was allowed to be lead vocals on the two E.L.O. songs. Next came a medley consisting of "Sweet Talkin' Woman", "Confusion", "Do Ya" and "Rockaria!". At 9.45 came the half-hour break. At this point, one could buy Phil's new CD "Alter Ego" for 15 euros, and get something drink or eat. Part 2 of the show started off with "Roll Over Beethoven" which had the audience clapping along to, but still no dancing ! But then came "Hold On Tight" and the miracle happened, as a pair came forward and danced in front of the stage. The spell was broken finally and the place between the stage and the first row filled with dancing human beings. "Don't Bring Me Down" was then probably obviously the high point, and the public sang along with Phil's vocals. Then however again came "Roll Over Beethoven" as addition, as if Phil wanted to show us how to do it correctly. "Crossroads" and "Superstition" were then the last songs performed this evening. Shortly after the concert, one was able to be photographed alongside Phil. 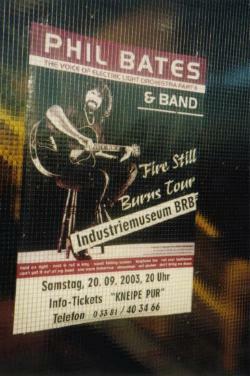 The tour promoter also told us that Phil would hopefully be traveling to Germany again in April 2004. Phil confirmed this and also mentioned that he hoped to have yet another cd ready for then too. On Sunday the 21st September 2003, we then went to to Hohennauen, a village 6km north of Rathenow. With at least 140 visitors, the village church was filled nearly up to the last place. I had the impression that everybody knew each other, as they welcomed each other. Inside the church, everywhere the lights filled the area with a nice candle light. On the bank where we sat arose in me a warm, welcoming feeling. We all waited patiently, as we all looked down to the front of the stage. At 7:10, the concert started, as four people pulled back the curtains to start the show. The sound was better than in Brandenburg, however due to the limited amount of space, we had no dry ice machine, nebulas and some spotlights. This time there was no break in the concert but there were differences in the songs perfromed. 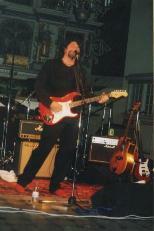 "Don't Wanna Lie Anymore" from Phil's first CD "Naked", was added. But he did not perform "She's A Woman" and "Walking Back Towards The Light". The audience applauded euphorically but it was only when "Don't Bring Me Down" started that some people dared stand and sing loudly. After 2 more songs for the encore, it was now almost 9pm and the concert was over. The fans here were much younger but they obviously enjoyed themselves. In Brandenburg the audience were much older, the majority over 40 years old. But I think, everyone had fun listening to the music of E.L.O. I am really pleased to have attended these two evenings of great live music, and I really hope to see Phil Bates again in 2004. Evil Woman, Rock 'N' Roll Is King, My Decline and Fall, Showdown, Can't Get It Out Of My Head, House Of Blues, Dolycannau, One More Tomorrow, Medley: Sweet Talkin Woman, Confusion, Do Ya, Rockaria! Roll Over Beethoven, Telephone Line, Writing On The Wall, Jealousy, Walking Back Towards The Light, She's A Woman, Whiskey Girls, Hold on Tight, Don't Bring Me Down. Roll Over Beethoven, Crossroads, Superstition. Review courtesy of Mike Franke (translated by Jim Hoban) - www.first-movement.de .